This product was added to our database on Monday 16 September 2013. TWA's President, Jack Frye was in the market for a long range aircraft to search out new air routes in the Middle East. Boeing - Seattle sold a post war B-17, 44-85728, to TWA with modifications as a VIP transport. A spartan airline interior was installed. The passenger compartment included seven airline seats, a bunk, office desk and a bathroom. There were rumors of a large overstuffed seat in the nose. 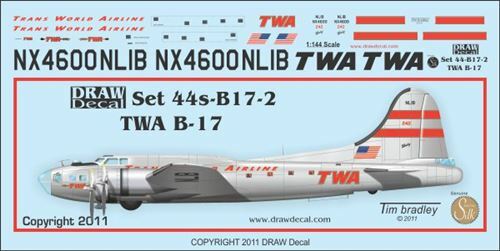 First licensed as Experimental NX4600, it became NL1B with TWA as a Limited category aircraft. This aircraft flew only for only one year. It was sold in 1947 to the Sjah of Persia (later Iran) registered as EP-HIM. It was then sold once again to France, flying as F-BGOE. This one of a kind B-17 was scrapped in France in 1970.